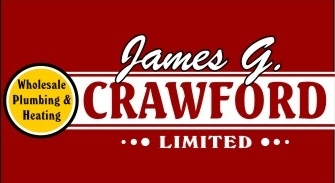 Founded over 100 years ago, James G. Crawford Limited is a family-owned wholesale business supplying plumbing and heating fixtures and materials to the St. John's and Avalon communities. We are committed to carrying a selection of quality brand names in the kitchen and bathroom fixture market to cater to the requirements of our clients. With the completion of our showroom in 2010, James G. Crawford Limited displays a selection of these products in a bright and inspiring setting. Although our products are mainly offered to contractors, commercial clients and designers, individual customers are obviously welcome! Our staff dedicated to customer service look forward to assisting you with the selection of your fixtures for your new home construction or renovation project. We will also be happy to send one of our knowledgeable and experienced crew members to evaluate your project needs. Situated at 29 Shaw Street in the west end of St. John's, James G. Crawford Limited also services the area of Avalon, as well as the entire province of Newfoundland and Labrador. Contact us today!